I tried to think of an inventive title for this post but....creativity is clearly escaping me and so here I am calling a spade a spade. Or rather a metallic kimono a metallic kimono. This one is from Zara and I got it in store last weekend. They have a fantastic collection of alluring metallics at the moment and whilst not all of it is practical (silver trousers anyone???) this most definitely is. I have worn this twice since I got it - slipped on over practically anything it takes the most casual and basic outfit and turns it up a notch. The metallic colour - a hybrid of gold and silver - is super flattering and the casualness of the shape makes it work for any body shape. It's an easy peasy piece - and we all like clothes like that, right? I took some photos today of Giorgio Armani's Eyes to Kill Excess mascara and hope to get that post up this week. It may be that I have been deprived of good lashes for so long (thanks Lancome Doll Eyes, thanks for nothing) but it's a truly incredible mascara. I know what I like and I like a BIG lash - exactly what this product provides in one coat. i love it! I wish zara would sell them in other colours too though. And i think your nails (still the gelish im guessing?) were a really really good choice! @nana - yes...imagine in a metallic navy! wow that would be gorgeous. and yes, still the Gelish :) love it! I did an OOTD post on my blog with an Alice & Olivia cardigan that is quite similar minus the metallic. Hope you'll check it out! @shimmering2light - sounds lovely and will do! Looks lovely! I'll have to have a closer look next time I'm shopping in Zara! Cute kimono! You have great style. I recently found out you're blogging again.....and I'm sooooooooooo happy!! I can't believe i didn't know sooner. 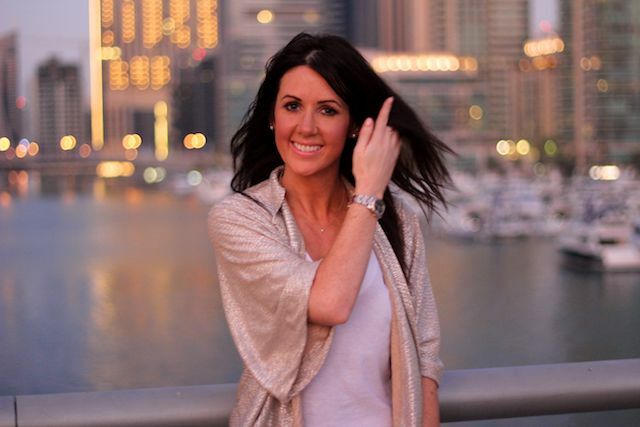 Love the blog and all your outfits!! I went through all your posts and now I feel the urge to go out and get a bunch of new clothes. You seem so happy Laura. And you look as lovely as always. I love that kimono. Looks gorgeous. You officially have me wanting one. this looks gorgeous and comfortable at the same time! I want one haha! Love it, it looks great on you! Omg you look amazing! That kimono is beautiful! I really wish it would have been sold out because I absolutely have to have it! ooh my that sure is lovely and subtely shiny! I WANT I WANT! your Kimono is lovely. I am definitely going to check it out today.I also love your necklace, its so dainty and pretty, where did you purchase that? Ha, I brought Stunning after watching one of your perfume videos and I got to say, I loved it and went through the bottle(s!) pretty quick. I'm loving the kimono and the metallic trend, in general. I find metallics much easier to wear then most bright colours and just as, if not more, interesting. 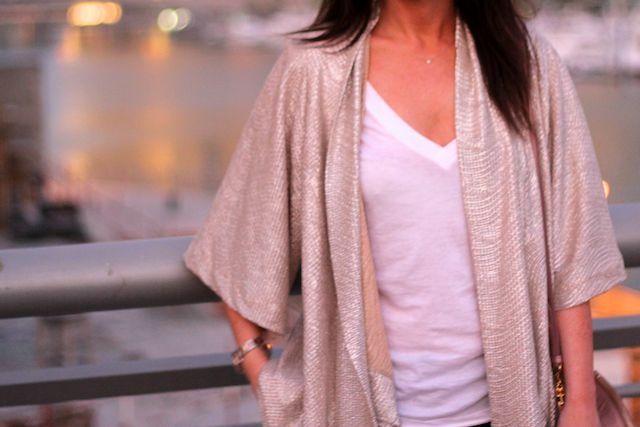 Love the metallic kimono! So pretty. 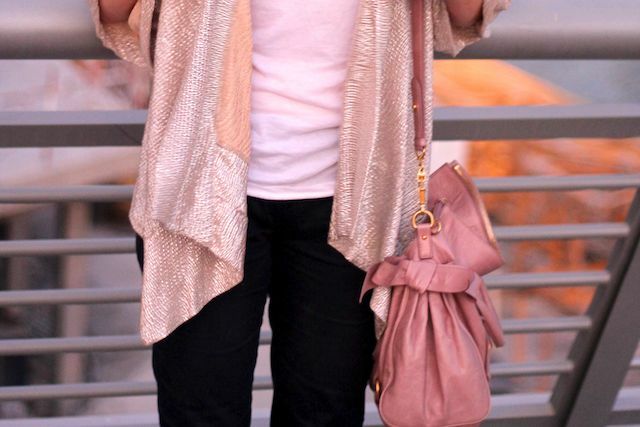 I love the color - it seems very neutral and does look as if it could glam up most any outfit effortlessly. Thanks for the warning about "Doll Eyes". Anxious to see and read about the mascara. I've yet to find "the one" when it comes to mascara. I really liked YSL Faux Cils but disappointed that the product seemed to dry out SO fast. This kimono looks like the same one they had in the summer, but in red. I really like it in metallic. So cool. Thanks for the "modelling" photos. Wauw, the kimono is gorgeous! I'm very surprised and interested in the idea of including the perfume you're wearing in outfit posts, I'm thinking about doing that. owhhh I love it, what a fabulous 'basic' to have to dress things up, beautiful shape! i saw this at zara, but it looks so much cuter actually on a person rather than a mannequin. and--all these pictures just make me love your miu miu more and more! Looks amazing with the handbag! Adore! wow...i LOVE the whole outfit!! Great outfit. How is Dubai. I am dying to visit. Looking great,love how you have put this together!! wow i love the kimono! i hope it's in store when i go to nyc! Love it! !and you look fabulous!!! love it! its so cute! I can't wait to hear about the mascara! The kimono looks awesome on you. In that lighting it looks like a lovely pink. I nearly bought this today. Your blog post made me realise I should have. Love the blog btw. Have you bought any of the £3.99 H&M skirts that are similar to this? Ridiculous price but love them! how much of this one? seemed quite nice for the design... many holidays in the end of year, going to choose some Chinese party dress for yourself! It has every little thing unrestricted as well as has the much more impressive 2D graphics. minimilitiaa Delight in the fantastic as well as main professional pack of mini-militia application. the step by step overview provided below to mount this application on TutuApp Android users require not root their device to mount any kind of application.